Brentford thrashed an error-prone Birmingham to deepen Blues' Championship relegation worries. Ollie Watkins' 25-yard shot found its way underneath David Stockdale before Florian Jozefzoon rounded the Blues keeper to make it 2-0 before half-time. Neal Maupay tapped in for 3-0, then Blues' third consecutive defeat was sealed when Stockdale's spill allowed Maupay to fire in via Marc Roberts. Watkins then headed in from Jozefzoon's cross to complete Birmingham's misery. 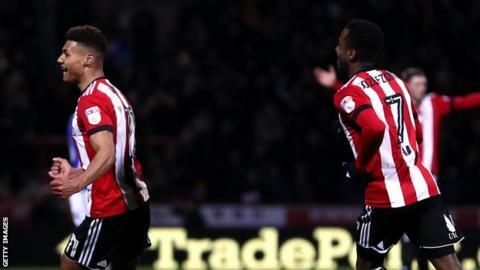 Brentford could have scored any number of goals, with Watkins and Maupay looking dangerous, before completing their biggest league win of the season, to climb within three points of Bristol City in sixth and leave Birmingham just a point above the relegation zone. Dean Smith's side continued their excellent league form at Griffin Park, where they have now lost just once in 16 league matches since the opening game of the season. For Birmingham, it was another concerning performance, as their defensive lapses were punished and they failed to score for a 17th Championship match this season. Top scorer Sam Gallagher came the closest, at 2-0, forcing Daniel Bentley to save one on one and skimming the crossbar, but Blues finished a third consecutive game goalless. "It was a very good performance from the players. We wanted a high tempo and to go and press them. "The pace and power from our wide players was excellent. We have always felt there was a lot of potential in Neal Maupay and he is getting better. "The top six is our aim but we have to take it one game at a time. There is a hunger, desire and character there that is really pleasing." "A very painful night. You can't make those mistakes we've made and expect to get anything out of a Championship game - especially away at Brentford. "Some of the mistakes we've made tonight are uncharacteristic of those boys. It put us on the back foot right from the off. We just can't give away the goals we've given away, let alone the missed chances. "We've had some tough results this season. We turn a corner with some positives ones, but since the defeat at Villa it's hard picking the players up again." Match ends, Brentford 5, Birmingham City 0. Second Half ends, Brentford 5, Birmingham City 0. Attempt missed. Che Adams (Birmingham City) right footed shot from the centre of the box is close, but misses to the left. Attempt saved. Sam Gallagher (Birmingham City) header from the centre of the box is saved in the top centre of the goal. Assisted by Cohen Bramall with a cross. Attempt missed. Yoann Barbet (Brentford) header from the centre of the box is close, but misses to the left. Assisted by Alan Judge with a cross following a set piece situation. Jason Lowe (Birmingham City) is shown the yellow card. Foul by Jason Lowe (Birmingham City). Corner, Brentford. Conceded by Maxime Colin. Attempt blocked. Florian Jozefzoon (Brentford) right footed shot from the right side of the box is blocked. Assisted by Ollie Watkins. Corner, Birmingham City. Conceded by John Egan. Attempt blocked. Jason Lowe (Birmingham City) right footed shot from the centre of the box is blocked. Goal! Brentford 5, Birmingham City 0. Ollie Watkins (Brentford) header from very close range to the bottom left corner. Assisted by Florian Jozefzoon with a cross. Offside, Birmingham City. Jota tries a through ball, but Cheikh Ndoye is caught offside. Attempt missed. Alan Judge (Brentford) right footed shot from outside the box is high and wide to the right. Assisted by Ryan Woods. Attempt saved. Che Adams (Birmingham City) right footed shot from more than 35 yards is saved in the bottom left corner. Assisted by Jota. Corner, Brentford. Conceded by David Stockdale. Attempt saved. Florian Jozefzoon (Brentford) left footed shot from the right side of the box is saved in the bottom right corner. Assisted by Ollie Watkins. Attempt missed. Alan Judge (Brentford) right footed shot from the right side of the box is high and wide to the right. Assisted by Emiliano Marcondes. Attempt missed. Yoann Barbet (Brentford) right footed shot from the centre of the box misses to the right. Assisted by Florian Jozefzoon with a cross following a corner. Corner, Brentford. Conceded by Cohen Bramall. Attempt saved. Ollie Watkins (Brentford) header from the left side of the box is saved in the bottom right corner. Assisted by Alan Judge. Ollie Watkins (Brentford) wins a free kick on the left wing. Attempt missed. Ollie Watkins (Brentford) right footed shot from the centre of the box is close, but misses to the left. Assisted by Florian Jozefzoon. Offside, Birmingham City. Sam Gallagher tries a through ball, but Che Adams is caught offside. Attempt missed. Florian Jozefzoon (Brentford) right footed shot from the left side of the box is close, but misses to the right. Assisted by Henrik Dalsgaard following a corner. Attempt blocked. Ollie Watkins (Brentford) right footed shot from a difficult angle on the right is blocked. Assisted by Kamohelo Mokotjo. Hand ball by Andreas Bjelland (Brentford). Attempt blocked. Neal Maupay (Brentford) right footed shot from the centre of the box is blocked. Assisted by Henrik Dalsgaard with a headed pass.